There is a whole book on the rules of racing but I reckon there are only 3 you need to know. Generally at Cransley if you are inexperienced, the other sailors will gently point out the error of your ways if you are wrong. If you have any doubts have a word with the Commodore or one of the more experienced sailors who will be happy to help you. Basically when you are tacking, often on the way to the first mark, if you are on Starboard you have right of way. I remember this one as “If you are sitting on the right of the boat, you’re alright”. This same rule applies for example two boats running down wind. Rule 2. Windward boat gives way. If two boats are on the same tack, the boat closer the wind gives way. 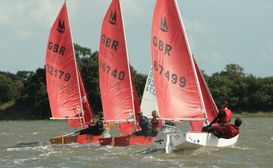 There are a few variations that the leading sailors get excited about (they will mutter complex things about overlaps and sailing your proper course), but just remember the basic bit. In the picture, the white boat is the windward boat and has to give way. Rule 3. Rounding a mark. What happens if you get it wrong? The main rule is avoid contact with another boat. 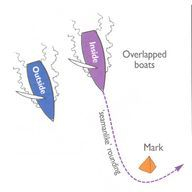 If the other boat has to take avoiding action because you have broken a rule, you will need to do a 720 degree turn – i.e. go round twice. It’s easier to bear away and start with a gybe. You will know when you have to do this because the other boat will be bellowing at you to do your turns. If you accidentally touch a mark, then you do a 360 degree (once round) turn sometime after the mark but before the next mark. Ever been in a situation where you think you are in the right but not sure? Have you been carved up by one of the experienced sailors but not felt you know the rules well enough to protest? 1. No one minds a protest – its a good way to find out who was wrong, so speak to the race officer if you are not sure for some guidance. Don’t just let it go, as at a minimum they will be able to explain the situation and who was in the right so you can learn.